James and I traveled to Chattanooga recently. Our focus, the riverfront area.Our first stop, Puckett's Grocery and Restaurant. They started out as a grocery store many years ago and got squeezed out by the large chains. They reduced inventory, set up tables and chairs and started serving meals. We share the Puckett's Mojo Burger. Yes, that's barbecue, slaw, baked beans and cheddar cheese on the hamburger patty. Delicious. After lunch we head around the corner to Ross’s Landing Riverfront Park, the site where the city began. We stand above the cascading waters that lead to the Tennessee River and watch Ace, a new friend, frolic in the water, running up and down the steps. To our left, set in the wall, seven carved and glazed clay medallions feature aspects of Cherokee history, religious beliefs and struggles with white settlers. This location is believed to be the point where the Trail of Tears began. Along the walkway a wall mural depicts Cherokee Native American Indians playing stick ball. The skies are blue and the temperature perfect for a game. I can almost hear their shouts of glee as someone scores. A short distance away children waiting to board a sailing museum play a game using a water bottle for the football. We sit and watch as they lope up knee high steps effortlessly. Soon they'll board the Nina or Pinta, which are replicas of Columbus's ships, built completely by hand and without the use of power tools. A man in a kayak streams by leaving a wake in the blue water. We enjoy the warm breeze as we listen to the children's laughter. We follow the path to the blue trees, a project bringing attention to the plight of old-growth forests around the world. The blue trees are found in just twenty other cities around the world. The paint lasts only three to four months before it fades away. Blue tree by the river. Beside the trees is the Market Street Bridge which crosses the Tennessee River. When it was completed in 1917, the 300-foot main span was the longest rolling-lift drawbridge in the world. Cars zoom by and joggers hurry past while we walk to the center. A shiver of fear passes through me as the boards seem to give. Between the wooden slats the river, far below, rolls on. Nearby is the Walnut Street Bridge. Completed in 1881, it's among the longest pedestrian bridges in the world and was the first bridge built across the Tennessee River for non-military purposes. A pedestrian path connects the riverfront park to the Tennessee Aquarium, one of the best aquariums you'll find anywhere. You can visit it, have lunch at Puckett's and still have time to see much of the riverfront. For dinner we head to Tupelo Honey Cafe at Warehouse Row. We start with fried green tomatoes nestled in goat cheese grits with roasted red pepper sauce and fresh basil, an odd-sounding combination to be sure, but delicious. 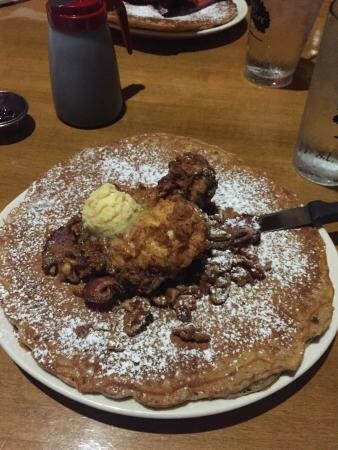 Next we share a Shoo Mercy pancake. Its sweet flavor and that of the syrup and spiced pecans blend well with the salty chicken and apple cider bacon. We push back from the table stuffed. We take a short walk around Warehouse Row. It's late and unfortunately, most of the stores are closing. Ah, a reason to come back to Tupelo Honey Cafe. Although we didn't have a long stay in Chattanooga we enjoyed the beautiful city with the warm Southern spirit. Someday we'd like to revisit Ruby Falls, Lookout Mountain and the Lookout Incline Railway and see places we haven't visited such as Coolidge Park with the 100 year old carousel. Maybe we'll take the "Pride of the South" Southern Belle River Boat Cruise or visit the Tennessee Valley Railroad Museum where we'll enjoy a ride on a reconstructed rail line that passes through Missionary Ridge Tunnel, or explore a bit of history at the Chattanooga National Cemetery with tombstones dating back to 1864. Whatever we do in Chattanooga we know we'll have fun because it's an inviting place with strong links to history, much natural beauty and unusual places to visit.